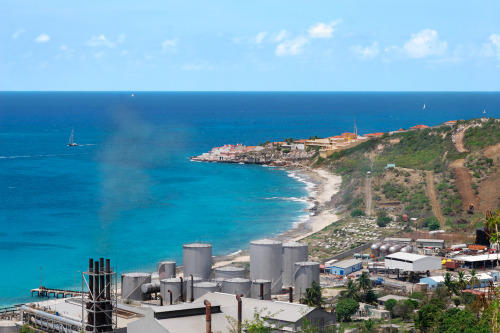 In recent years the use of desalination technologies in extracting potable water from seawater has spread beyond the affluent and desert-surrounded locations in the Middle East – and a few locations in California and Australia – to major population centres in Southern Europe, India, East Asia and Africa (image shows plant in the Caribbean). Demand for water is increasing rapidly. Some forecasts foresee €400-€500bn of investment per annum – just to keep up with this growing demand. Seawater desalination will form an increasingly important part of coastal water systems (where much of the population growth takes place) as an abundant source of water. And this is already happening: In recent years the use of desalination technologies in extracting potable water from seawater has spread beyond the affluent and desert-surrounded locations in the Middle East – and a few locations in California and Australia – to major population centres in Southern Europe, India, East Asia and Africa. In Southern Europe for example, Barcelona, Malta and Cyprus already source the majority of their potable water from desalination treatment plants, while recent investments in Israel have seen more than half the country's water supply come from desalination sources. Meanwhile, a desalination plant launched in 2010 in Chennai, India provides potable water for 2.5 million people. The key challenge to deploying desalination is in the cost of energy required. The current leading desalination processes require large amounts of energy to either boil seawater (MFS technology), or push it through sophisticated membranes (RO technology). It is estimated that 28%–50% of the total cost of running a seawater desalination facility is due to electric power useage, according to the WaterReuse Association. Traditionally desalination plants have been powered by fossil fuels, either directly drawing energy from the grid, or co-locating the plants close to coal- or natural gas-powered plants. It stands to reason that the global scale up of desalination technology driven by the use of fossils as the primary fuel source is both extremely expensive ' leading to unaffordable increases in water cost to societies ' and highly polluting. For instance in the United Arab Emirates (UAE), up to 3.5% of the total electricity produced goes towards desalination. And continued increases in power generation capacity are needed to keep up with the growing water demands of its growing population – not to mention industrialisation. While thus far increased desalination electricity requirements have been met with natural gas power, the investment and running costs are increasing rapidly. In Abu Dhabi alone the annual cost of building, maintaining and operating desalination plants is due to reach US$3.22bn by 2016. So could the powering up of desalination plants with renewable energy sources be a logical next step in the development of seawater desalination? Until a few years ago the high cost of renewable energy and the energy inefficiency of the available desalination technologies made such integration unfeasible on a large commercial scale, even though it may have been possible on a smaller scale (island developments for example). Yet in recent years, solar and wind power costs have come close to grid-parity precisely in some locations where seawater is plentiful, and frequently where there is a freshwater shortage. At the same time, continued innovation in desalination technologies is contributing to the improved efficiency of desalination processes. Research over the past two years – undertaken by CambridgeIP – has shown steady progress in making the desalination technologies more energy efficient, as well as increasing the maturity of direct integration technologies. We will explore some examples of this in part 2. Helena van der Vegt is a Senior Associate with CambridgeIP and leads on projects in the energy and cleantech fields. She has worked with multinationals, SMEs, start-ups and public sector organisations, providing advice on R&D and IP strategy throughout technology and innovation lifecycles. The company has worked with organisations like the International Renewable Energy Agency and the World Intellectual Property Office to build a patent and technology database of more than 4,500 desalination-related inventions (see Van der Wegt, Iliev et al. (2011), Desalination Technologies and the Use of Alternative Energies for Desalination) – as well as 900 inventions relating to the integration of desalination and renewables. Such technology information libraries can be used by inventors and acquirers of technology alike to identify cutting edge technologies, identify collaboration partners and also understand the scope for innovation in a sector. And it can also provide an early indicator of accelerating activity. The full report can be found here. Desalination is the option to get potable water from salt water on a large scale especially in Gulf. More and more technologies for converting saline water are emerging. Very Interesting. It looks that this is a vital technology for future as water scarcity is alarming.